The birthday cakes of my youth were simple affairs: you chose either chocolate or vanilla cake, and then either chocolate or vanilla frosting. The resulting four possible cakes were well within the skill set of any mom, although presentation values varied widely across households. We were always able to overlook non-parallel layers and patchy icing jobs because we knew that the cakes were baked from scratch – no mixes allowed. Cake mixes have their advantages. They’re easy to prepare, they produce consistent results every time, and the resulting cake is moist and airy (as long as it’s consumed within 24 hours of baking). 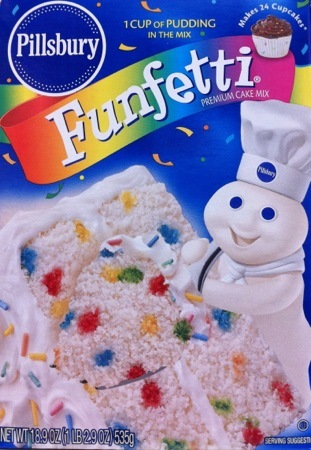 They’re almost too easy to bake; the original mixes only needed to have water added. The more recent incarnations, requiring the addition of water, oil, and eggs, were formulated to make the process “feel’ more like baking – a rare instance of labor-intensive steps being added to a convenience food. It’s no surprise that the first two ingredients are sugar and flour, but if you leave out the components of the sprinkles (shellac! ), what remains is leavening agents, stabilizers, and a few preservatives. When you include the user-added water, oil, and egg, it almost looks like a real cake recipe. 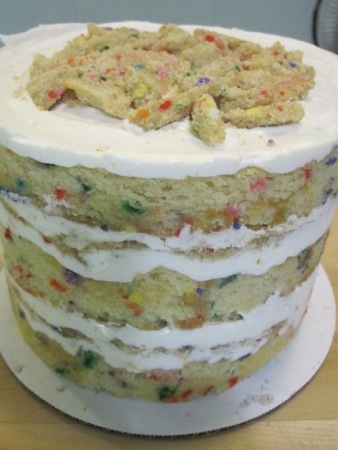 …we undertook the recipe development task of re-creating my favorite, and the ultimate birthday box cake, Funfetti, from scratch. 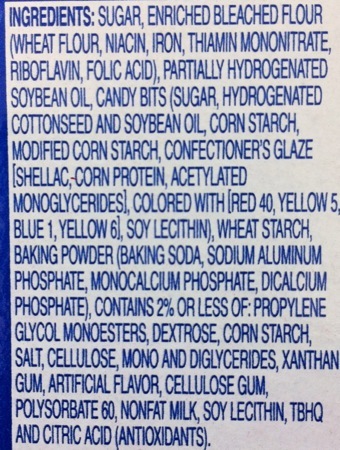 …Turns out that looking on the side of the cake mix box at the monster ingredient list was really helpful in getting the “secret” stuff we couldn’t figure out by taste. Scary as that sounds, there are no odd ingredients in the cake other than clear vanilla extract, which is vital to preserving the color of the cake and frosting. We were visited by friends a week after She Who’s birthday dinner. One of our guests shares a birthday with her, so I decided to make the birthday cake for dessert. 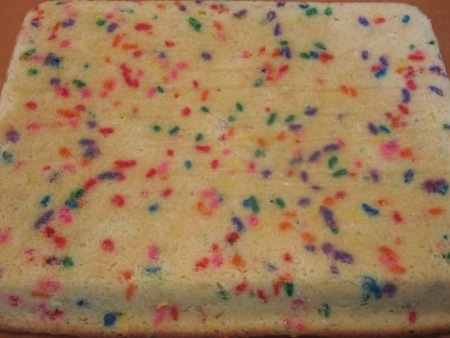 I began with one of the components, birthday cake crumbs, which is sugar, flour, and rainbow sprinkles – all bound together with oil and vanilla extract. 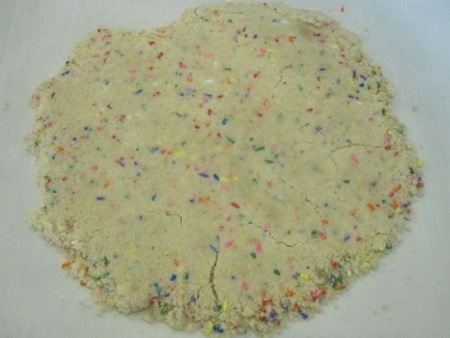 The mixture is baked and cooled, and the resulting solid mass is broken up into irregular crumbs. The cake is made with a standard creaming method using a mix of butter and shortening, with buttermilk added to the wet ingredients to accelerate the rise from the baking powder in the dry ingredients. And, of course, more rainbow sprinkles. With crumbs, cake, and blindingly white frosting at the ready (and did I mention how difficult it was not to snack on each of the components?) I assembled the cake: cake layer (soaked with vanilla-scented milk), frosting, crumbs, frosting – repeat to final layer which is topped with the remaining crumbs. After an overnight freeze and a four-hour thaw in the fridge (necessary steps to set the cake and make it sliceable), it was ready to eat. 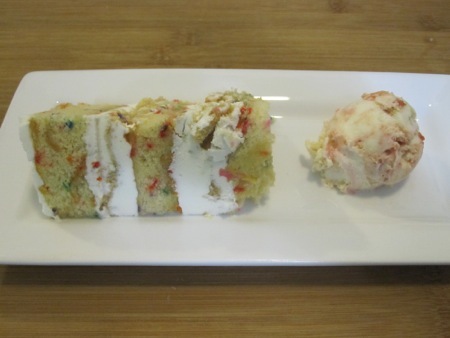 It’s not a birthday celebration without cake and ice cream, but I had already found the perfect complement: nyan cat ice cream – coconut sorbet with cherry Pop Tart chunks and muhkwas – a custom flavor created by Toscanini’s for ROFLcon. It’s a very sweet cake, which made the ice cream seem much less sweet by comparison. One of our guests, not knowing that I made the cake from scratch, commented “You made a Funfetti cake? This one tastes really good!” I guess that’s a compliment.